Cross-platform — You can use them with a mixed collection of Windows, Apple iOS, & Android operating sytems. Cross-device — You can use them with any computer, tablet, or smart phone. Accessible anywhere there is internet — The apps all are connected to your Google account. So whether you’re on a public computer at the library, visiting a friend and borrowing a device, using your computer at work or hanging out at home, you simply connect to the web, sign in to your Gmail account, and you’re ready to use any of these apps. Available offline — Most of these apps allow some sort of offline file storage & use, as long as you have the app on the device you are using. So you can work with them when you don’t have an internet connection. 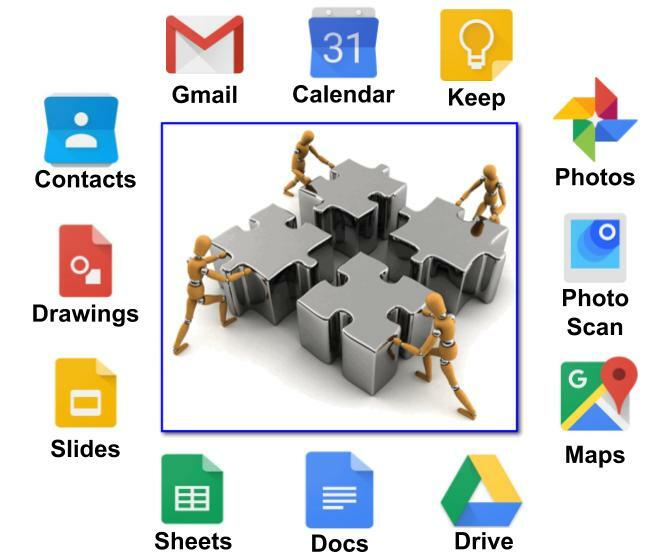 Allow collaboration and sharing — Most of these apps allow you to share files and folders containing collections of files. In most cases you can decide whether you want to share a file or folder as “read only” or designate the people you’re sharing with as “collaborators” and allow them to make changes and edits. The amount of control is up to you. Let’s take a closer look at each app. More info: What’s So Great About Gmail? Each family or team member must each get their own free Gmail account. This allows them to connect and share all the apps, documents, and services described below. One person can collect and manage email for several different people. Specifically, because Gmail can collect mail from other email accounts, a parent or spouse or team leader could pull in copies of a child or spouse’s or team member’s email into a single account. The “Send mail as…” feature allows Gmail’s outgoing email to display the email address (e.g. “John-Doe@blockhead.com”) that matches the outside mail source from which it was collected. See Gmail’s “Settings, Accounts & Imports” for details. You can set up a Gmail address book group containing only the email addresses of those family or team members you want to share messages with. Then simply select this single group name as the recipient in the “To” field of your email message and everyone who’s in that group will get the message. Import calendars from other calendar programs. Set up and “layer” several separate calendars (i.e., one for work, personal, medical, exercise, etc.). View all, some or just one of your calendar layers. Zoom in on an individual day or week or zoom out on a month or entire list of events (“agenda”). Share your entire calendar or share one layer. View and edit combined calendars (yours, your friends/family). Share one or more calendars & its reminders among family members. Create an event or appointment, then send an invitation to one or more family members to accept or reject. Create a note by choosing to “draw” with stylus or finger, “dictate” using device microphone (with Google’s voice to text) or simply type with a keyboard. Capture photos and attach documents to a note. Create to-do lists with check boxes that can be “checked off” (marked completed) and tracked. Color code notes and tag them with suggested labels (or your own custom labels) for search. “Pin” important notes that you use often to the opening window of the app. Assign collaborators to work on a note with you. Schedule reminders to nudge you and your collaborators to take action on a note (These also appear in your Google Calendar). Use powerful Google Search to search within the app and find any of your notes quickly. Share to-do lists and track items as they are completed. Collaborate to create plans for a trip or a family project (dinner? wedding? special team meeting? “all hands” effort?) and attach pertinent photos, documents and links. Maintain a family diary of important achievements, goals, etc. Maintain a family reading list with links. Automatically back up all your photos from all your devices to the cloud. Create and share entire albums, individual photos, collages, animations, videos. Use built-in editing tools to crop, clean up and beautify photos. Find anything you can imagine among thousands of your photos using Google’s powerful image search capability. No need to tag photos any more! Google’s Search will find you the photo you’re looking for! Create and share an album of photos from an event such as a wedding, family vacation, team training exercise or reunion. Consolidate and archive a collection of photos of people or special events captured by many different family or team members using different devices, then share the folder with a web link. Create and share a memorial album of photos of a departed loved one and display as a slide show at a funeral service. Turn an online photo album into a physical, printed book commemorating a special event. Share your entire photo library with anyone! Scan and “clean” printed photos (e.g. old snapshots & printed pictures from a photo album) & save as digital files using your phone’s camera. Back up scanned photos to Google Photos. Searches, finds and specifically locates destinations on an interactive map and gets real-time GPS navigation, traffic, transit, and details about millions of places, including user reviews and times of day these places are likely to be busy. “Get there faster with real-time updates. Beat traffic with real-time navigation, ETAs and traffic conditions. Catch your bus, train, or ride-share with real-time transit info. Save time with automatic re-routing based on live traffic, road closures and traffic incidents. Navigate with lane guidance so you don’t miss a turn or exit. Find pit stops along your route like gas stations and coffee spots. Find top-rated restaurants and local businesses, wherever you are. Decide on the best places to go with reviews, ratings, and pictures of foods and interiors. Plan your visit and see menus, make reservations, and find when places are typically busiest. Help others discover the best places by sharing reviews, photos and more. Just look at that list of features above! It’s easy to see a zillion ways your team or family could benefit from using Maps. Specifically, if one person is able to get solid, accurate trip-related details and share these with everyone else, then your team or family spends less time wandering around lost and travel coordination is a breeze! Create lists of places labeled “Favorites,” “Starred Places,” & “Want to Go,” then share these lists with family or team members or make a list public so anyone can find that special “meet-up” location. In Part 2 of this series we take a closer look at Google’s Drive, Docs, Sheets, Slides, Drawings, and Contacts, as well as five bonus Google apps or services you might want to check out. So Stay tuned!